Apple has introduced a ‘print’ button onto iPads, iPhones and iPods. Unfortunately you need a special “AirPrint” enabled printer. Thankfully there is an application called ‘Handyprint’ that allows you to print to any printer. Here’s where to get it and how to use it. On your iPhone at the bottom of some apps is a ‘share’ button. If you click this button you get a menu of different ways to share the content, one of these options is ‘print’ as shown below. STOP PRESS: Forget everything below. There’s a great new app by Samsung called “Samsung Mobile Print” and it can print to any printer on your wi-fi network from your iPhone without you needing to put any extra software onto your computer. It even printed to my Xerox laser printer first try which usually is a little tricky to get going. Thanks Bogdan for this tip. If you want your non-airprint printer to appear then you can download the following free donation ware $5 application called ‘AirPrint Activator‘ ‘HandyPrint’ from netputing. It’s free for 14 days then it asks for a donation of a minimum of $5. It used to be free, then it was donation ware, now it costs $5. If anyone finds a free alternative let me know. You download it to any computer that’s attached to your printer. Your computer acts as a bridge between your iOS device and printer. Click here to go to the netputing page to find the latest version. Download the little application called ‘HandyPrint’. You may then need to click on the ‘downloads’ button in the top right of Safari to find where it has been downloaded to. Click on the ‘Show Downloads’ button to find it. Now run HandyPrint by double clicking the HandyPrint application. You should get a window that looks like the one below. 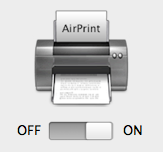 Press the slider to ‘Turn On’ AirPrint. 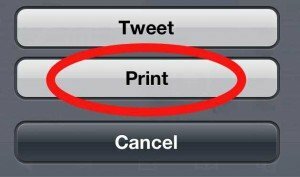 The Printer should now appear in your iPad or iPhone printing menu! There is a PC version that I’ve found but it costs $20. You can download from here: http://www.collobos.com Anyone found a free PC version? There is an alternative way of doing this. 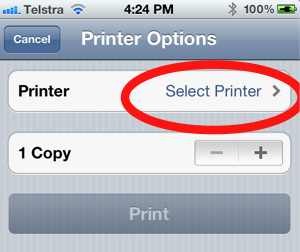 You can an app on your iPhone or iPad that will attempt to print directly to your printer. ‘Printer pro’ in sone such app and there is a good set of instructions here. There’s a free version that will let you see if it works here. I am not recommending Printer Pro. When I tried it all it printed was 11 pages of gobbledygook. Also, Printer Pro doesn’t work on some printers, and so they have released a ‘helper app’ called desktop helper which you can run on your computer. That now means you are running two apps. The good thing about handy print is that it uses the printer drivers on your computer, so if your computer can print to your printer then handy print can as well. Handyprint only costs $2 more. How to create a Google cloud printer. How to match the colours on your monitor to your printer. How to save toner when printing black on a colour printer. 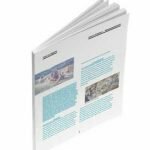 Printing to a NON postscript Fuji Xerox printer How to stop paper curling in your laser printer – printing with the grain. Thanks for the info. it works for me and finds really helpful. Article did not mention this app http://printair.wiseapps.pl Works great for printing from iPhone to non-AirPrint enabled printer!